Two versions of the VS-x450 transmitter are available: with a 2 x 4-line display (VS-4450) and without a display (VS-B450). Both transmitter designs are manufactured in accordance with the 19" standard. The transmitter can be mounted as required in a panel housing or wall mount housing as well as in a 19" rack. The transmitter has 4 sockets for output cards. A total of 4 analog outputs or 3 analog outputs and 1 serial output (RS232 or RS485) can be installed. 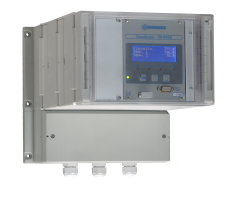 The analog outputs can be configured for every available measurement parameter. The advantage of this is that, for example, two analogue outputs can be configured for measuring viscosity: one over the entire range (showing the trend) and the second for just a section of the range (better resolution allowing a process to be regulated within a specific range). The analog outputs also permit decadic transmission of the measurement data. 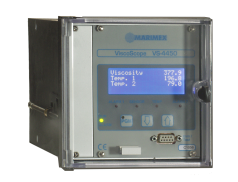 If the ViscoScope system is to be used without connection to a process control system, a relay card makes it possible to implement alarms or time proportional regulation Time proportional regulation allows the operator e.g. to dose solvents or add solid materials with a high degree of precision.